Brewer Loft & Roof Conversions originally started back in 1985 and now with many years’ experience spent entirely in this field, have established ourselves as one of the area’s leading specialists in quality design and the building of loft and roof conversions. We have completed hundreds of conversions ranging from simple small playrooms to major roof alterations consisting of multiple bedrooms, studies, bathrooms and en-suites. Your initial enquiry will be dealt with promptly and an appointment will be arranged to visit and assess the feasibility of your loft. After discussing your requirements advice will be given on suitable and practical solutions for the loft and normally at this point estimates on likely costs will be given. Guidance on planning and building regulation procedures will also be given at this stage. It’s worth remembering that somewhere between a quarter and a third of the volume in the average home is tucked away under the roof. This space (often wasted and used only occasionally) could be transformed into a beautiful living area. Your loft has the potential for additional bedrooms, bathrooms, studies, offices for the home worker and even just a playroom or hobby room. Building into the loft is comparatively straightforward and involves less red tape and mess than building an extension and remember none of your garden is sacrificed for the extra space. There are a few questions you need to consider before embarking on converting the loft. Generally most conversions come within two categories, the typical loft conversion to a bungalow or house which can be converted by adding dormers/roof windows. Or a roof conversion whereby if the existing roof is found to be too low it can (subject to permission) be removed and a new roof can be constructed to a higher pitch, this enables greater overall space and more flexibility with your requirements. Dormers protrude from the roof slope and give more internal headroom, they can be designed to suit your property and taste. Dormers can vary from the smaller pitched roof type, adding character to your home through to the larger flat/sloping roof variety, which will give more general space. Any dormer and gable conversions will normally have Upvc windows installed to match those on your existing property. Where the roof shape is not altered only genuine Velux roof windows would be installed. We are registered installers of Velux windows. All their products carry a comprehensive ten year guarantee. Usually these are traditional and purpose made to suit individual lofts and tastes, and in third storey conversions we normally match the existing staircase. We can also fit spiral and space-saver stairs. These are normally included in your package and will be fitted by our in-house team. All gas work is Gas safe Registered, all electrical work is Part P compliant. A start date will be confirmed in writing well in advance of commencement (weather permitting). Completion for a typical loft conversion can be 4-8 weeks. 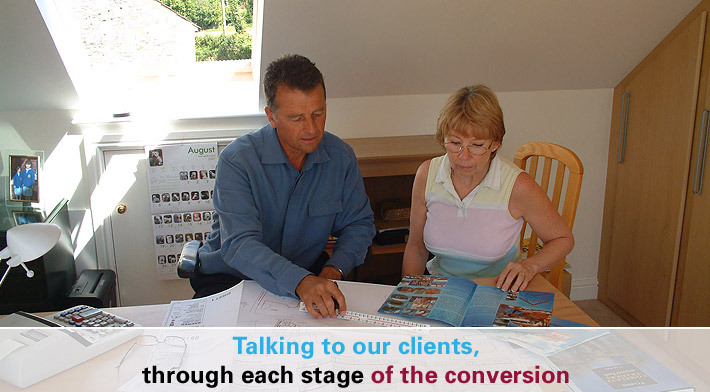 Completion for a typical roof conversion can be 9-12 weeks. Any disturbance and mess is kept to a minimum, your home will be left clean, tidy and safe on a daily basis. You do not have to vacate your home during construction. All work on your home will be carried out by trained and permanent staff. We are members of the Federation of Master Builders, which offers a comprehensive low cost optional Masterbond Warranty scheme for peace of mind. This is a 10-year insurance backed guarantee. If we can be of further assistance, please Telephone or Email Us.